Featuring the Carhartt logo and a "brown" reflective finish, this custom patterned Carhartt sunscreen helps reduce the interior temperature when it's hot outside, it also helps protect the vehicle interior from damaging UV rays that enter through the front windshield all year long. 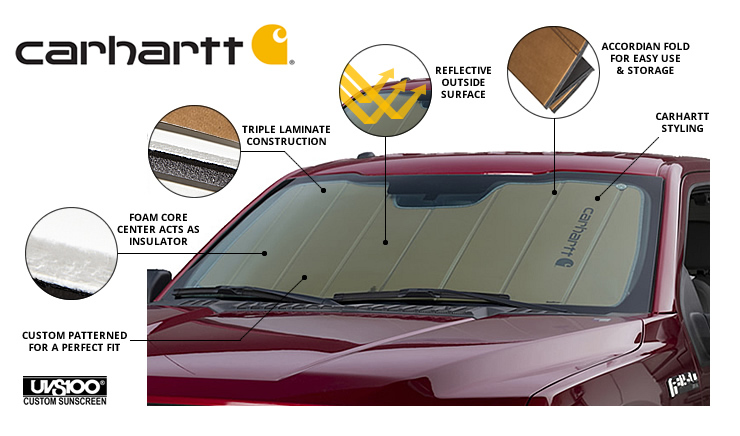 Carhartt UV windshield sunscreens are custom fitted to your vehicle to ensure maximum windshield coverage and ease of installation. Also known as Carhartt heat shields, Carhartt sun shields or Carhartt UV shields, Carharttt sunscreens they are useful at the beach, work, airport or anywhere you park. This premium quality, custom patterned folding Carhartt sunscreen has a reflective fabric on the outer side, soft felt on the inside to help protect your interior. * Please Note: Covercraft UVS100 Custom Sunscreens may not fully cover the entire glass area on some vehicles. Windshield pillar post angle to the dashboard, rear view mirror shape & size, camera and sensors all can prevent the Sunscreens from providing total blackout coverage. Its normal to have up to 1" of space on the sides to allow for install and removal with ease. The window sun shield / shade can not be made to the same exact size of windshield, being non flexible, and installing without bending and forcing into place and damaging the shields. The Covercraft Factory pattern designers make the windshield sun shades as to provide maximum coverage with easy install and removal.